Dr. Dee Sherwood is a member of the social work faculty at Western Michigan University. She teaches courses on the American Indian Boarding Schools and intergenerational trauma in Indigenous communities. She is a mixed blood descendant of Paiute, French and English Nations. Dr. Sherwood has helped to organize community events in the Grand Rapids Urban Indian community including film screenings, marches and educational forums, including events featuring Dennis Banks, co-founder of the American Indian Movement. She served as the advisor to the Native American Student Association at a local university. She also co-authored a curriculum guide published by the Ziibiwing Center for Anishinabe Culture and Lifeways. In this seven part interview, Dee talks about the origins of boarding schools in the US, how the history of boarding schools was a form of genocide against indigenous people, how boarding schools impacted indigenous communities, where some of them were located in Michigan, how this history is rarely taught even at the university level and how indigenous people have dealt with the consequences of boarding schools. 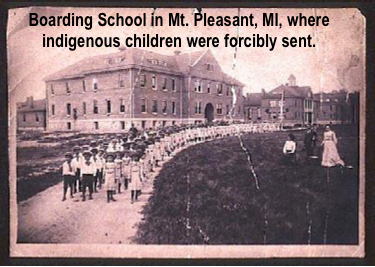 This entry was posted in Indigenous Resistance and tagged boarding schools in Michigan, Dee Sherwood, genocide against indigenous people. Bookmark the permalink.